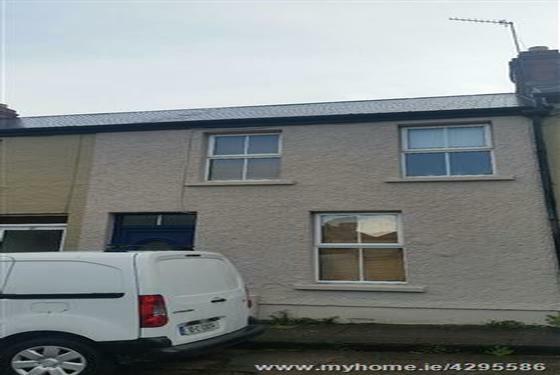 Garry O'Donnell of ERA Downey McCarthy auctioneers is delighted to present to the market this immaculately presented and extremely well designed two-bedroom terraced property which has been extended to the rear and has had the upstairs accommodation reconfigured to incorporate 2 bedrooms, one of which boasts a walk in wardrobe and bathroom. 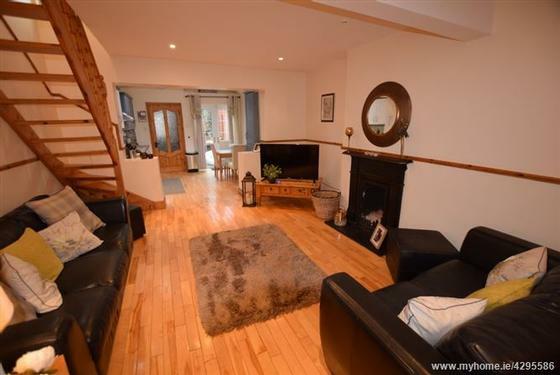 Positioned within this much sought after and mature cul de sac off the old Blackrock road, the property is sure to appeal to a whole host of buyers to include first time buyers, traders down and investors. 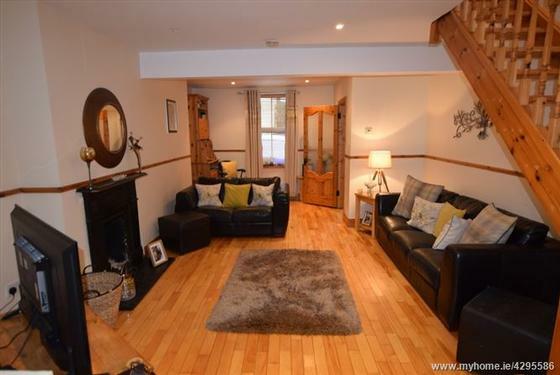 Accommodation within the property consists of a reception hallway, a superb open plan extended kitchen/dining/living room, a utility room and a guest W.C.
Upstairs the property has two bedrooms- one double room with a walk-in wardrobe and en suite and the other is a generous sized single room. 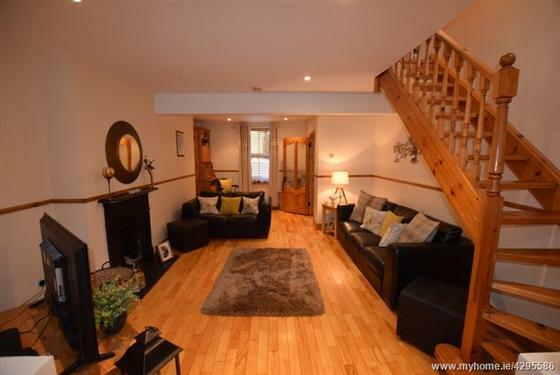 The rear of the property features a fantastic enclosed rear yard with timber fencing on both sides and a mature stone wall built to the rear. 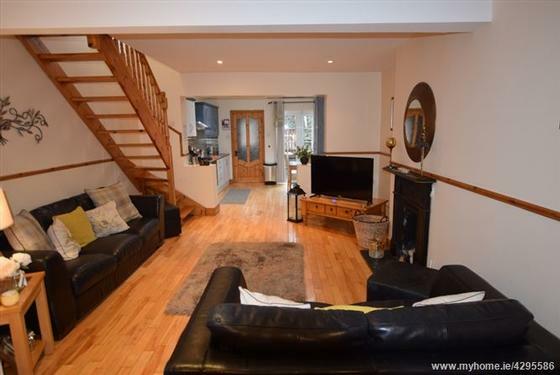 The yard is laid out over two levels with a concrete area located off the kitchen/dining area and steps from here allows access to a raised decking area. Please see Eircode T12 AW9H for the directions. A PVC door with stain glass centre paneling allows access into the reception hallway. The hallway features high quality timber flooring, attractive neutral décor, one centre light piece and two power points. A timber door with glass paneling allows access to a superb extended open plan kitchen/dining/living area. This magnificent room offers modern décor with high quality solid timber flooring and recess spot lighting. Other features include an open fireplace, eight power points, one television point, built-in storage space and an open arch from the living area allows access to the kitchen/dining area. There is one window to the front of the property which includes a Venetian blind, curtain rails and curtain. This extended kitchen/dining area features modern fitted units at eye and floor level with extensive worktop space and a tiled splashback. 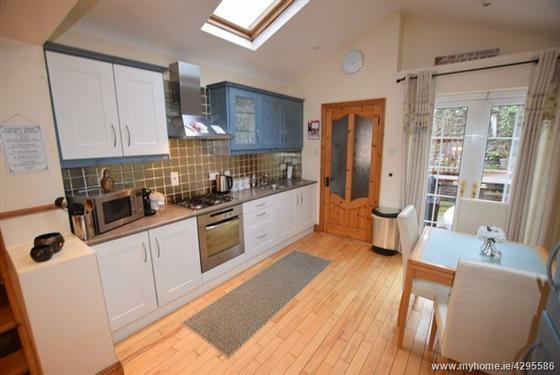 The room is flooded with natural light with 2 large velux windows in place, recess spotlighting and the kitchen includes an integrated oven, hob, extractor fan and a stainless steel sink and drainer unit. 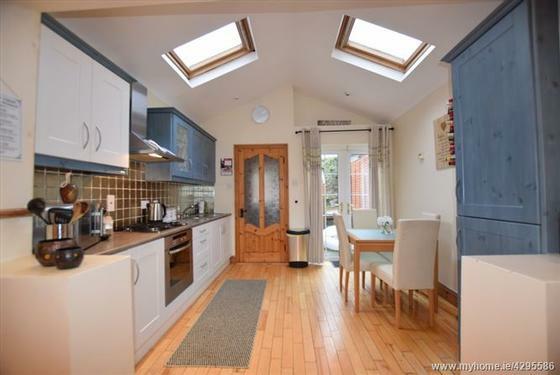 The area has solid timber flooring, extensive dining space and a large built in storage cabinet. Double doors allow access from the room to the rear yard. 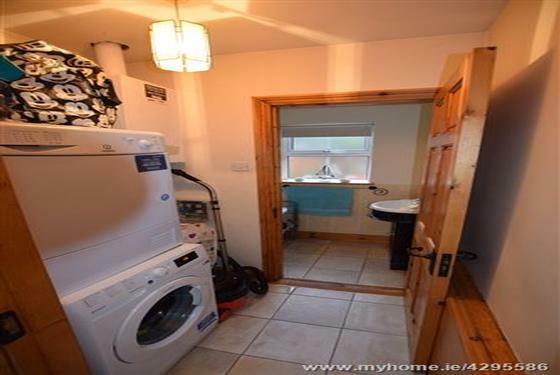 The utility room which is located off the kitchen has tile flooring, plumbing for a washing machine, space for a dryer and the gas boiler is located here. Features include one centre light piece and two power points. A door off the utility room allows access to a downstairs guest W.C. The guest W.C features a two-piece suite and has attractive tile flooring that carries through to half way up the surrounding walls. 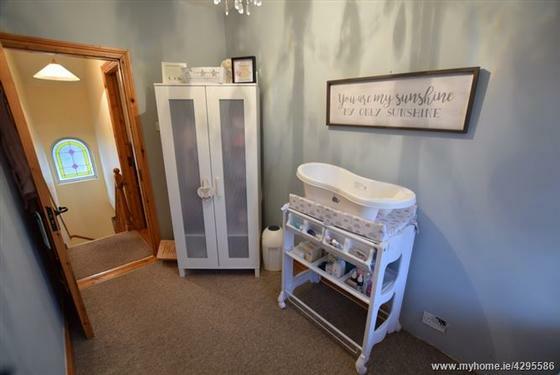 Features include one window to the rear of the property with a blind, one centre light piece and a built-in storage unit is positioned underneath the wash hand basin. 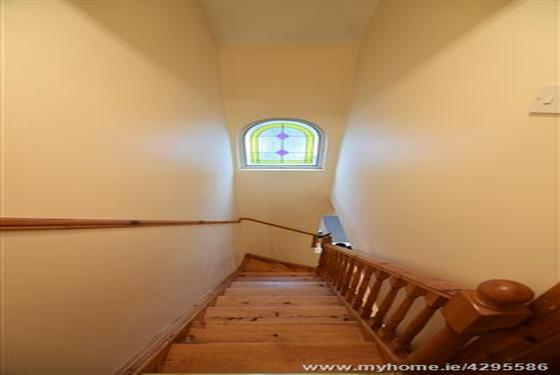 A superb staircase allows access to the first-floor landing. The landing has carpet flooring, one centre light piece and a feature stain glass window which overlooks the rear of the property. 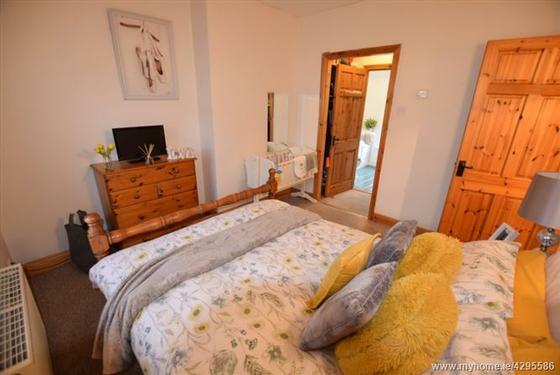 This is a spacious newly reconfigured double bedroom which benefits from the addition of a large walk in wardrobe facility and a full-sized bathroom. 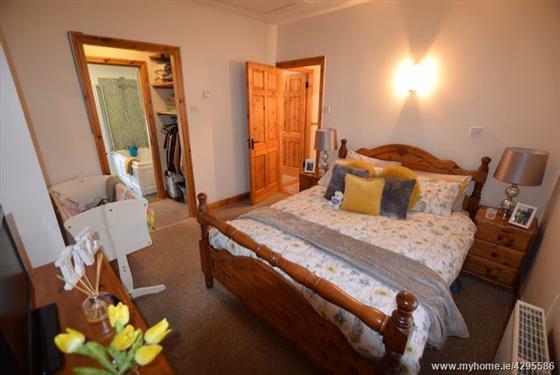 The room has a one window to the rear of the property that includes a venetian blind, carpet flooring, one centre light piece, a television point, one wall mounted light piece and six power points. A stira staircase allows access to the attic area. An open arch from the bedroom allows access to the walk-in wardrobe area which offers extensive hanging area and storage space. A door off the walk-in wardrobe allows access to the en suite. 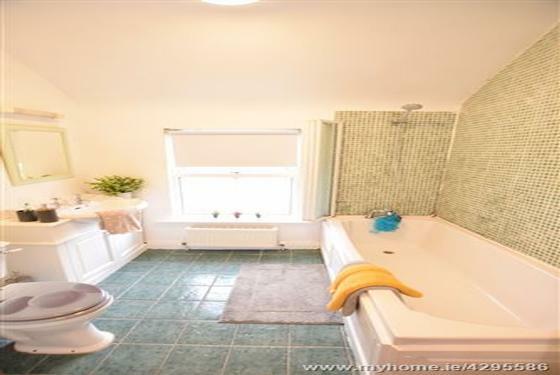 A fantastic ensuite bathroom has a three piece suite with a pump-action shower over the bath. 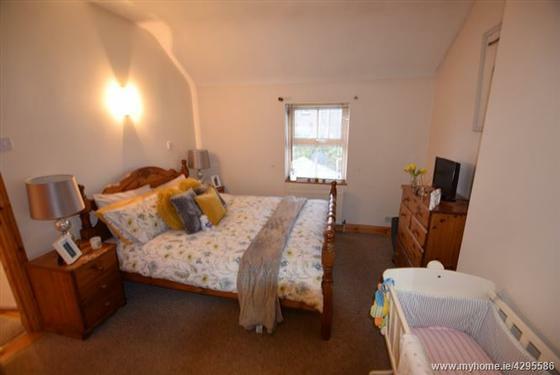 The room has tile flooring, tile surrounding the bath and a window to the front of the property with roller blind. There is one centre light piece, one wall mounted light piece and a purpose-built storage area located under the wash hand basin. A single room has one window overlooking the front of the property that includes a venetian blind, curtain rail and curtains. 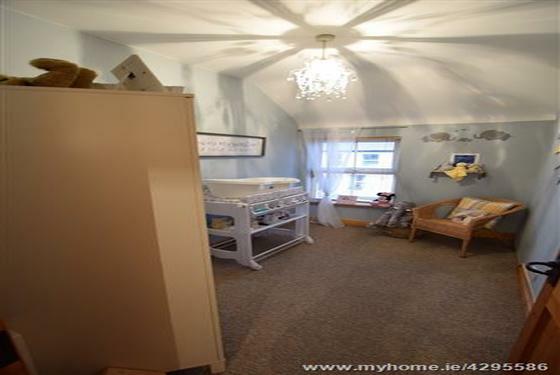 The room has carpet flooring, attractive décor, one large radiator, one centre light piece and four power points.